Valve finally has a new game out. Can you believe it? 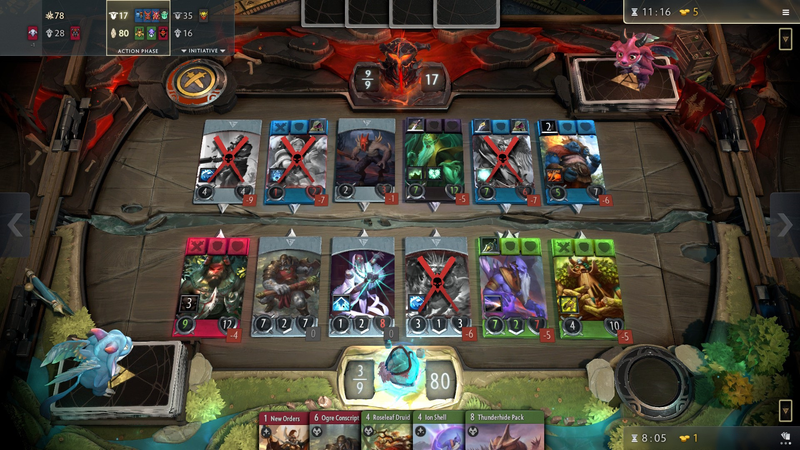 A card game based on Dota 2, Artifact launched today on Steam. After having messed around with it for several hours, I can report that there is indeed a ton of stuff going on in Artifact, but that it’s also one of the more approachable card games I’ve played, at least when first starting out. Although it draws obvious comparisons to Blizzard’s Hearthstone and Magic: The Gathering (whose creator is actually Artifact’s lead designer), it plays much more like a real-time strategy game translated into cards. That shouldn’t be surprising given Artifact is inspired by Dota 2, a MOBA that originally began life as a mod of Warcraft 3. At the same time, it’s remarkable just how much Artifact feels like a card game in name only. Sure, you open card packs, construct decks, and then hope you draw a good starting hand once each match begins. But during the moment-to-moment play itself, every decision and potential trade-off is measured in terms of how it will affect positioning and relative troop strength on the battlefield. I swear the game’s not nearly as complicated as it looks. Here’s how Artifact is played. Two players start with decks made up of at least 40 cards, but as many more as they want. Each one has five hero cards, which are colour-coded as red, blue, green, or black. Each match takes place on a battlefield that’s divided into three lanes, with one turn involving action on all three, from left to right. These individual lanes have a tower on either side with 40 health. Players’ heroes are placed across them, dealing damage against the tower each turn unless blocked as other creatures and spells are played. When a tower is destroyed, that player’s Ancient, which has 80 health, is revealed. One side wins by either destroying enemy towers on two separate boards, or the Ancient. Probably not. And that’s with me skipping a lot of the important details, like the fact that towers produce mana, which is required to play a card in a given lane, and that at the end of each turn, the number of creatures you killed determines how much gold you get in order to buy item cards which get added to your hand and can be played for free. Artifact’s tutorial does an excellent job of explaining everything, guiding you through to separate, mostly pre-scripted, matches against bots without getting too deep into the weeds. Everyone is desperate to get their hands on this guy. I’m already itching to spend money on Artifact’s most expensive card. Ax is one of my favourite heroes to play in Dota 2. He’s big, strong, red, and, as you might imagine, carries a giant axe. 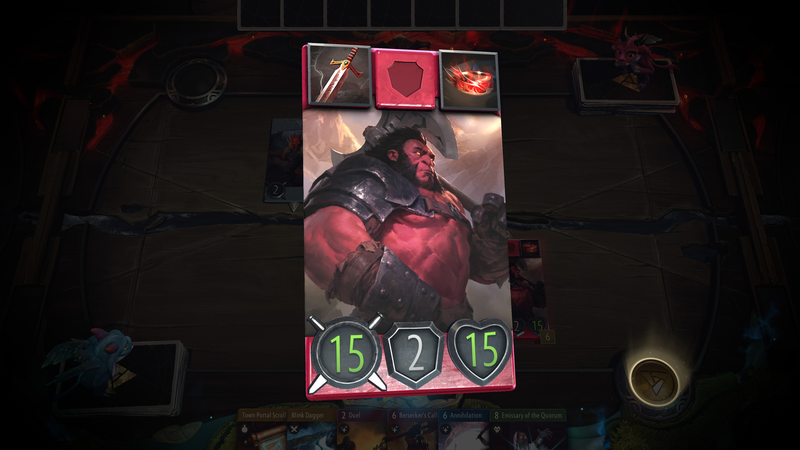 In Artifact, there are special hero-adjacent cards that automatically populate in a deck when a certain hero is selected. Ax players get Berserker’s Call, which lets them have one of their heroes battle a different enemy than the one in front of them. In a game that’s primarily about positioning, that’s a huge deal. As a result, Ax is currently the most prized card in the game, which is why he’s so expensive to buy outright – $16 in fact (about £13). At the same time, my gut, along with some back-of-the-envelope maths, tells me I’d be better off paying that $16 (or less, the price appears to be plummeting fast) if I really wanted Ax rather than spend that much on card packs in an effort to get him. That’s the magic of a collectible card game that’s attached to a digital marketplace. Artifact strikes a good balance between being entertaining to look at and not crowding the screen with too much information. The game only shows you one lane at a time, and it’s pretty seamless clicking between them or zooming out to see the entire board at once. It’s much less Dota 2 and much more Hearthstone, which is fine in my opinion, since Hearthstone has possibly the best user interface of any game ever. I love how worried these little things get when you’re totally screwed. The big red X over things that are about to die is super helpful. I’m not as sharp as I used to be. Especially when playing a complex card game in bed at 2:00 a.m. Artifact is great at letting you know what’s going to happen before it happens, including how much damage opposing enemies and towers will take when a turn ends, making it easy to decide what cards to play before then to make sure that what you want to happen, happens. 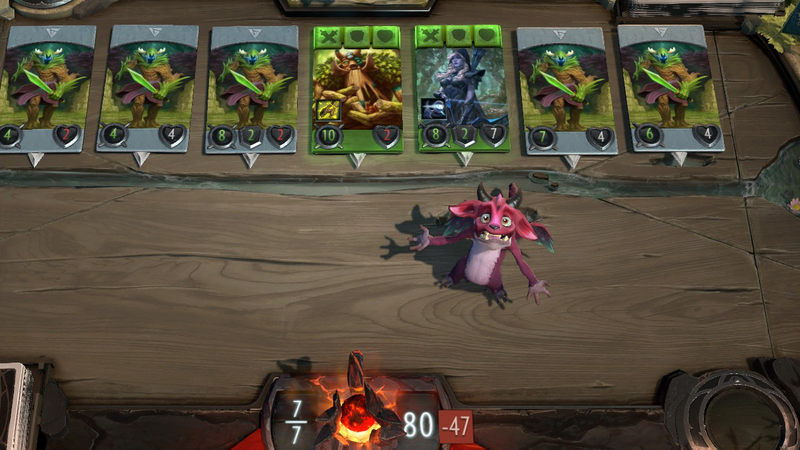 Artifact feels like a new type of card game. We’ve had glimpses of different ways to do card games since last year when Hearthstone launched its single-player Dungeon Runs, and more recently with Slay the Spire, a dungeon crawling roguelike whose battle mechanics are all card-based. Artifact feels like an extension of both of those ideas, taking things like mana costs, creature blocking, and tower defence and using them to try and recreate a strategy game experience in a slightly different context. While I’m not sure I’ll end up falling in love with Artifact in the same way I did Dota 2, it already feels far and away like the year’s best new video card game. Sorry, Gwent.